That’s the motivation behind the Cyclone Center project, which is soliciting help from “citizen scientists” around the world in an effort to improve our understanding of tropical cyclones. 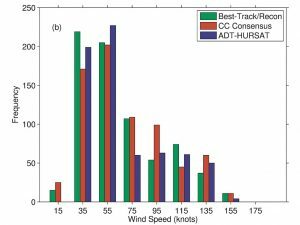 Accurate, consistent data is critical for studying tropical cyclones and for determining what effects, if any, climate change is having on these storms. 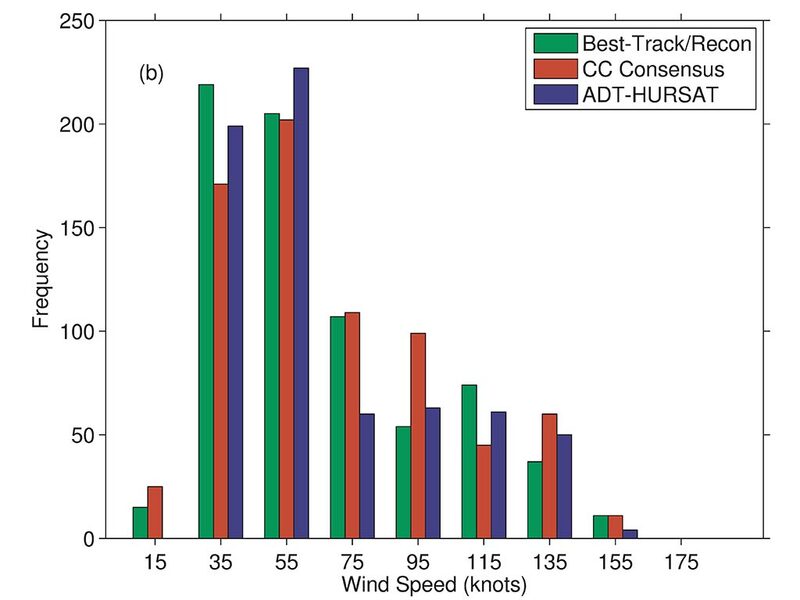 However, the quality and consistency of existing data sets are limited by a scarcity of direct measurements and by differences in the way various agencies categorize storms. Tropical cyclone experts have devised a process for improving data by manually analyzing infrared satellite images of these storms. But with nearly 300,000 images from more than 30 years of storms to analyze, it would be impractical for experts to process more than a fraction of the available information. That’s where the Cyclone Center project comes in. 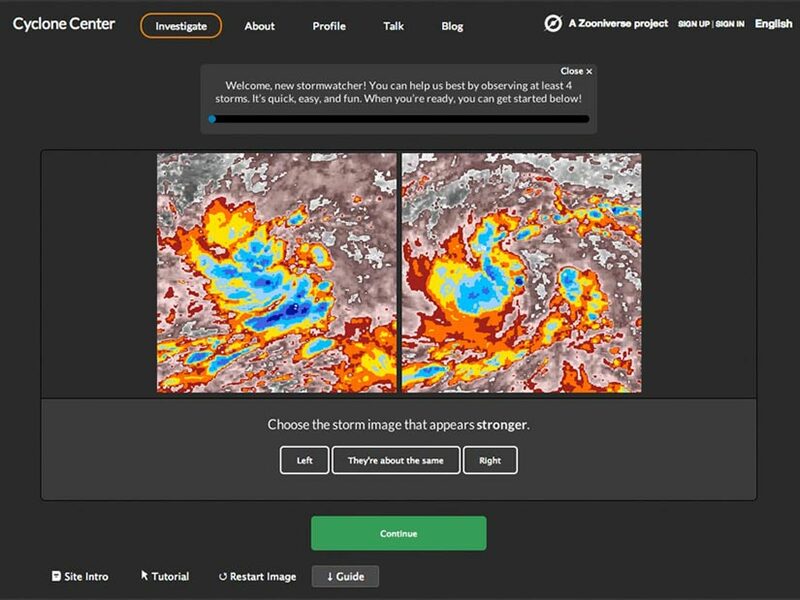 Taking the “many hands make light work” approach, the Cyclone Center website (http://www.cyclonecenter.org) allows anyone in the world with an internet connection to try their hand at categorizing tropical cyclones. The project is a collaborative effort involving Chris Hennon of UNC-Asheville and the Cooperative Institute for Climate and Satellites-NC (CICS-NC), Carl Schreck and Scott Stevens from CICS-NC, and Jim Kossin and Ken Knapp from NOAA’s National Centers for Environmental Information, along with a team of web developers at Zooniverse (www.zooniverse.org). The team has already compiled some impressive numbers, boasting more than 7,400 users and more than 360,000 classifications in the first two years. With a new, easier-to-use website design and a just-published paper presenting the methodology and early results, they expect even more impressive results in the months ahead. That’s the question the Cyclone Center team addresses in a paper just published in the Bulletin of the American Meteorological Society. Along with their coauthors (Paula Hennon and Jared Rennie of CICS-NC, Mike Kruk from NCEI, Peter Thorne of the Nansen Environmental and Remote Sensing Center, and three citizen scientists from France, Germany, and Australia), the team analyzed some of the initial results from the project. The results are encouraging. It appears that consensus estimates from these “non-experts” generally do as well as, and in some cases better than, an automated computer algorithm applied to the same data. The Cyclone Center estimates are also proving useful at resolving some of the significant discrepancies found in existing data sets. The goals are ambitious—a complete processing of the data would require more than one and a half million additional classifications. But the project has already demonstrated its value, and the new, easier-to-use web interface should help attract new users while keeping the existing crew of citizen scientists engaged in the process. You can find more details on the early results on the Cyclone Center blog. The full text of the BAMS paper is also available online here. To start getting involved, just go to www.cyclonecenter.org. You can start classifying storms yourself in just a couple of minutes!